This Hollyhock is from Deb's garden. 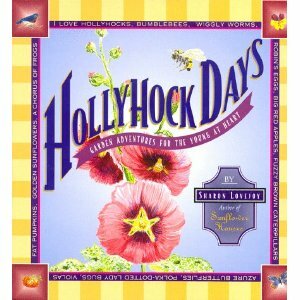 She's reading Hollyhock Days by Sharon Lovejoy. 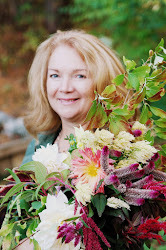 Deb says, " It's never too late to learn the wonders of a garden whether in a pot or a plot! Sharon says, " Gardening is for Kids of ALL ages ". Gardening IS child's play so don't forget to have little ones by your side as you weed, plant, water and wonder at the marvels of nature at work." Welcome to Farmgirl Friday blog hop # 18! 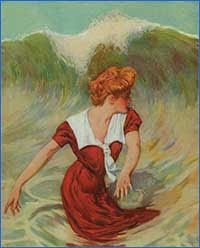 The image above was created by a talented MaryJanesFarm employee for the MJF Beach Farmgirl blog. and I just love it! 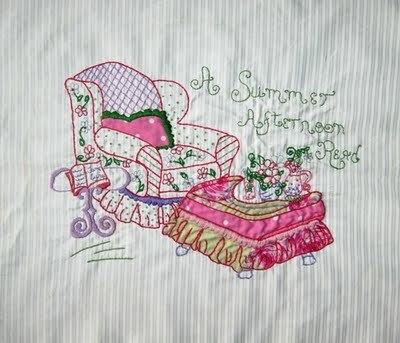 I've been writing for MJF since March 2011 as their Beach Farmgirl Blogger . 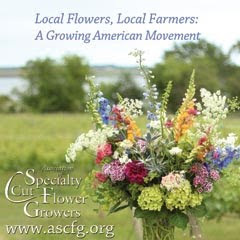 I am so enjoying sharing and learning all things " farmgirl " in that forum! Stop by and visit me sometime! I would like to invite you all to the Farmgirl Connection page for MaryJanesFarm. It's a terrific place to meet more friendly and talented farmgirls, and you can learn about becoming a member of the sisterhood too! Yeah, I know it's one more stop on the internet highway of life but it's a stop worth making! 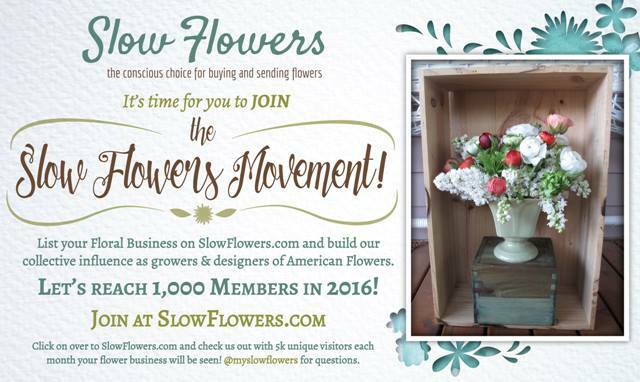 Welcome new followers and subscribers! It's so nice to have you here! Have fun and don't forget to leave a note in the sand your way out! If you think it's too hot for Fairies to be out in the Garden, look again! Today I was playing around in the garden taking photos and I had the idea to bring a table I created for our daughter ( when she was in her " fairy phase " ) out into the garden for a photo shoot! 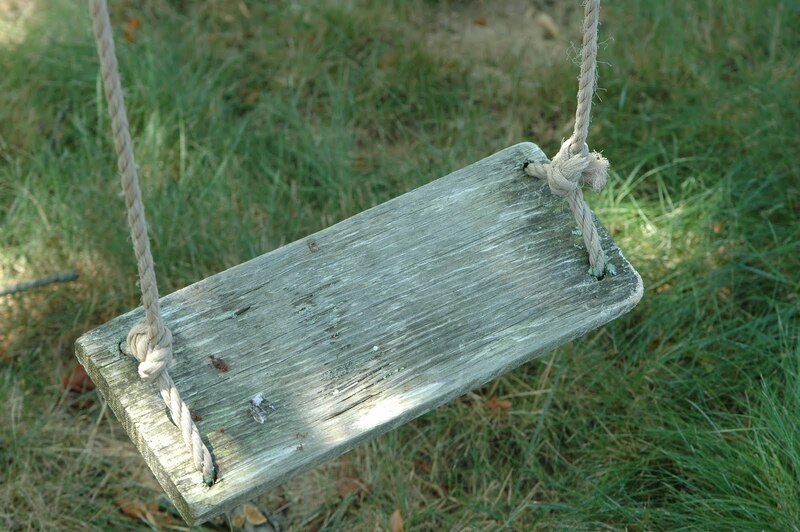 It brought back so many memories of her days as a young girl playing make believe and building Fairy Houses. She could entertain herself for hours on end outside. She's still like that but she's too old for building Fairy Houses now. I thought I would share this little table with you just incase you have a little " believer "( or two or three ) in your home. The Fairy images are called Wallies .I purchased mine at Michael s Craft Store. They come pre-pasted and ready to apply. Unknown--"Where you believe there is magic...you will find it." We all need a little magic dust blown our way from time to time... Consider yourself dusted! 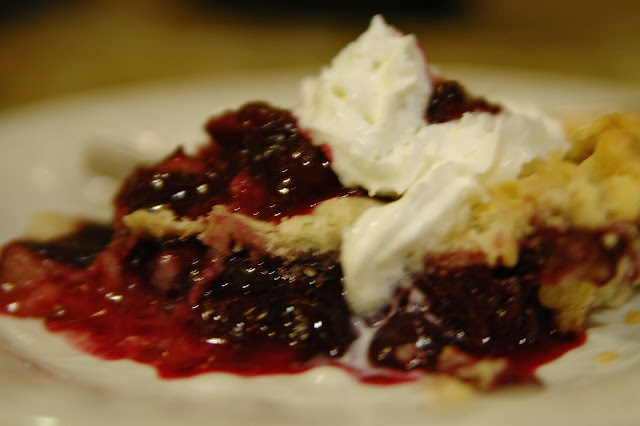 Strawberry, Blueberry, Rhubarb Pie~ Oh My! I recently read that this is the year of the Pie. My husband would choose pie over cake any day of the week so I've taken to trying my hand at baking some of his favorites from scratch. I LOVE fresh fruit pie anytime of year especially in Summer! I'll confess that I'm a rookie pie baker. I used to buy frozen fruit pie but I've since learned how easy it is to make them myself and I ( we ) don't miss the frozen ones AT ALL.! I started with plain Rhubarb, ( hubby's favorite ) and when I got a thumbs up from the family, I graduated to Strawberry/Rhubarb pie, Peach Pie and my personal favorite, Blueberry Pie. Chop rhubarb into one inch bit-size pieces and place in large mixing bowl. Rinse and drain blueberries and strawberries. Slice strawberries thinly and add all berries to the chopped rhubarb. Stir together sugar, Minute Tapioca and 1/4 tsp nutmeg. Add sugar mixture to fruit and toss to coat. Let stand for 15 minutes. Fill a pastry lined 9 inch pie plate with fruit mixture. Dot with small pieces of butter. Add your top crust and adjust. You can make small blueberries from left over dough to decorate the top of your pie. I sprinkle a bit of sugar on the top crust and cover the edges with foil. Place pie on cookie sheet in preheated oven at 375. Bake for 25 minutes. Remove the foil then bake at 350 for 25 minutes more or until golden brown. Serve Warm with whipped cream or Vanilla Bean Ice Cream! How about you? Cake or Pie? I'm linking this post to The Homestead Barn Hop ! Welcome to week 17 of theFarmgirl Friday blog hop! And what a week its' been. I think I have most of the bugs worked out after losing my domain name. All you need to do is update your blog list with the new address and if you have my blog button you can grab the new one with the correct code from my side bar. If you are a feed blitz subscriber you might not be getting post updates in your inbox due to my original domain feed not linking to my blog any longer. Please be patient with me... I will be emailing each of you personally with the new blog address! In the meantime you can subscribe by email again by using the link on my sidebar or click that follow button today for fresh updates. Now, on with some good old fashioned farmgirl soulfood! Green Chicken Coop from reclaimed materials. We've come a long way baby when it comes to keeping chickens. Melissa's coop is so pretty she's tucked it into her side yard along the driveway approaching the front of her home! It looks so natural there and fits right in with her cottage garden theme. 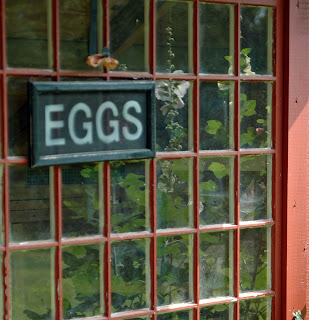 This little coop and run houses 8 chickens and Tilly rules the roost! The inseparable Buff Orpingtons poked their heads out of the nesting boxes for a short hello. Tending her flock is simple with this easy access door and nesting boxes on the rear of the coop. I was very impressed with the look and function of her coop and I think her " girls" like it too! I also got a tour of her pretty Cottage Garden. It's always fun to see a fellow Gardner's yard. It was inspiring to see many of the plants that I have at home, planted in a different way. Melissa has a slope in her back yard which can be a challenge but she and her husband have created a private outdoor sitting area out of reclaimed stone in their backyard as the focal point. 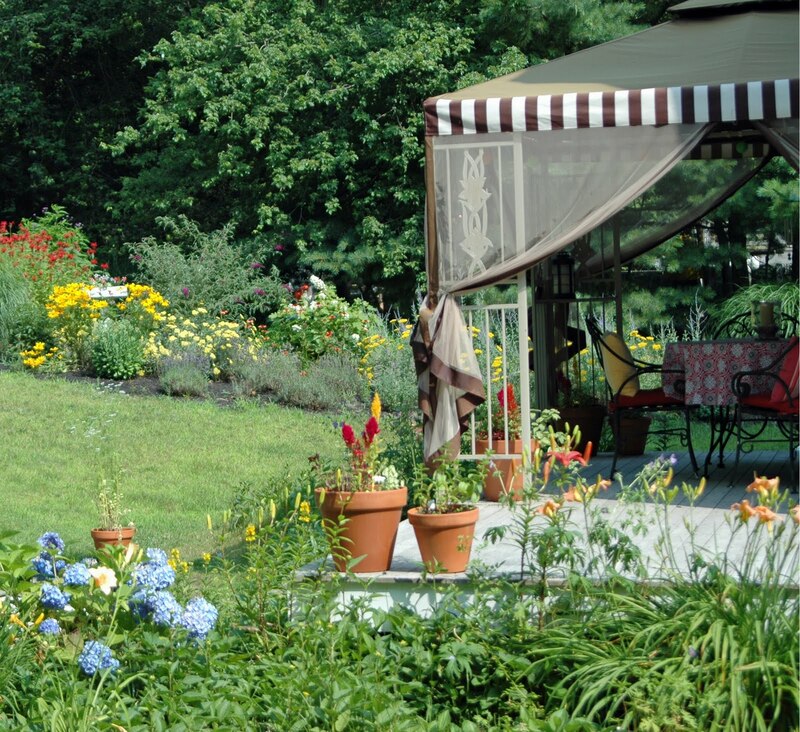 The patio is surrounded by lush, colorful cottage garden favorites like, Hydrangea, Butterfly Bush and Day- lillies. This grouping of Endless Summer Hydrangia and ornamental grasses let's you know you are visiting a classic Cape Cod garden. Quaint garden elements like this cobalt blue bird bath look refreshing on a hot day and the Shasta Daisies seem to be waving the birds in for a quick dip. Cone Flower and Day Lilly brighten a narrow border and keep a climber company too! What do you say, we have a seat in Melissa's garden then link up for our weekly dose of farmgirl soulfood? 1.) Write a post about your farmgirl lifestyle and brag a little about your farmgirl talents while your at it! Share what being a farmgirl means to you. Include lots of photos of your farm, crafts, animals, quilts, home decor projects and thrifty make overs, your backyard garden, hen house, studio or workshop. You get the idea! Welcome new subscribers and friends! Thanks for all you share! Keep that farmgirl soul-food comin'! 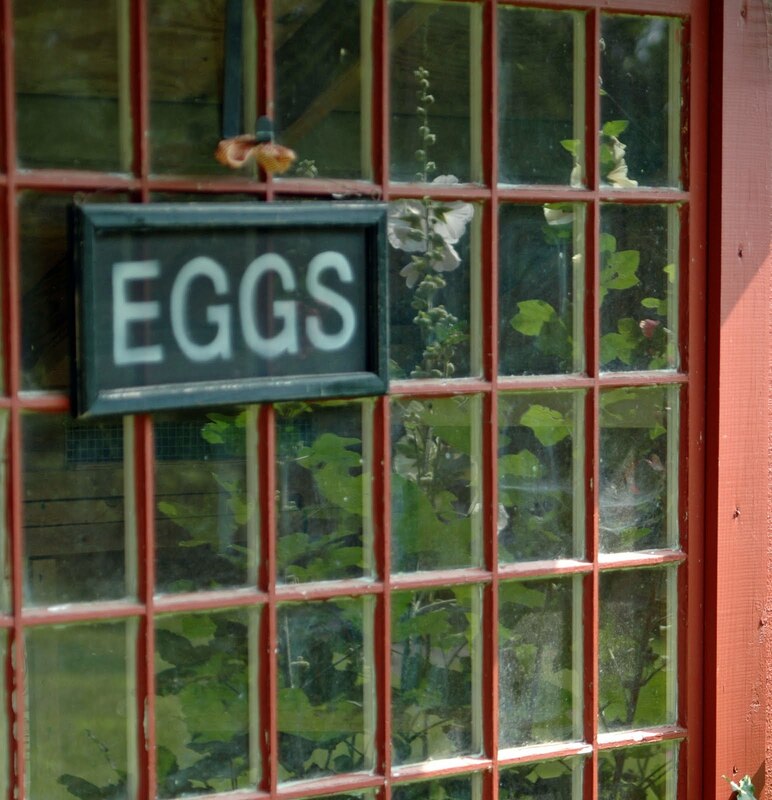 Don't for get to leave a note on the Garden Gate on your way out and be sure to stop by my MaryJanesFarm BEACH blog to read my latest post: A Children's Garden Growing Community. I'm linking to Fertilizer Friday today! hasn't been operational for a few days. Well, here's the scoop! My domain name expired due to my credit card info needing to be updated. I believe it has been purchased or hacked. Right now, my choices are: I can pay GoDaddy for 69.00 to negotiate a buy -back for me or blog from a FREE blogspot address. I've switched to blogspot for now to keep things running smoothly while I continue working on the problem. Here is a copy of an email I received a week ago. I'm not sure if it's related to my issue or not!? On July 11th 2011, We received Tianhua Ltd's application that they are registering the name " deborahjeansdandelionhouse " as their Internet Keyword and " deborahjeansdandelionhouse .cn "、" deborahjeansdandelionhouse .com.cn " 、" deborahjeansdandelionhouse .asia "domain names etc.., It is China and ASIA domain names. But after auditing we found the brand name been used by your company. As the domain name registrar in China, it is our duty to notice you, so I am sending you this Email to check. According to the principle in China, your company is the owner of the trademark, In our auditing time we can keep the domain names safe for you firstly, but our audit period is limited, if you object the third party application these domain names and need to protect the brand in china and Asia by yourself, please let the responsible officer contact us as soon as possible. Thank you! If you are not appropriate person, please forward this to your CEO, because this is urgent. Thanks. If you blog from a custom domain, make sure your payment info is updated annually! Go in to your payment history on your my account page and update your credit card info if you've gotten a new card. If you are using the same card but have been issued a new one with a new expiration date be sure to update it. This is what happened to me before I knew it my blog was missing! Go Daddy said they do contact people when their account is about to expire, but I had checked the don't send me updates box when I registered with them so I didn't receive a notification. Oh well, shoulda, coulda, woulda right? That little boo boo left my domain name up for grabs! And someone grabbed it! A special thanks to Pat of Corninmycoffee pot and Faith of Crochet by the Sea and anyone else I may not know of yet for spreading the word! I so appreciate you all! If you subscribe by email you may subscribe again and in the meantime, I'll see if I can import subscriptions to this address. Please help me spread the new link to other readers! If you have my Farmgirl Friday button on your sidebar please remember to update it to the new link! Thank you for your patience while I work out the kinks! To visit past posts go the my READ ALL ABOUT link on my sidebar. The links at the top of the page are not operational yet. 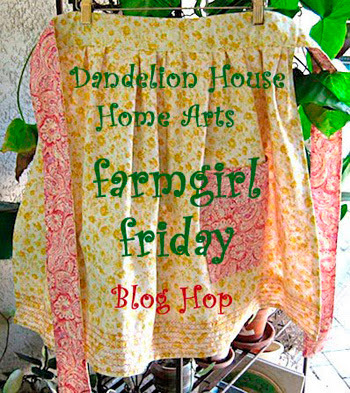 I hope to be back in the swing of things for this weeks Farmgirl Friday! 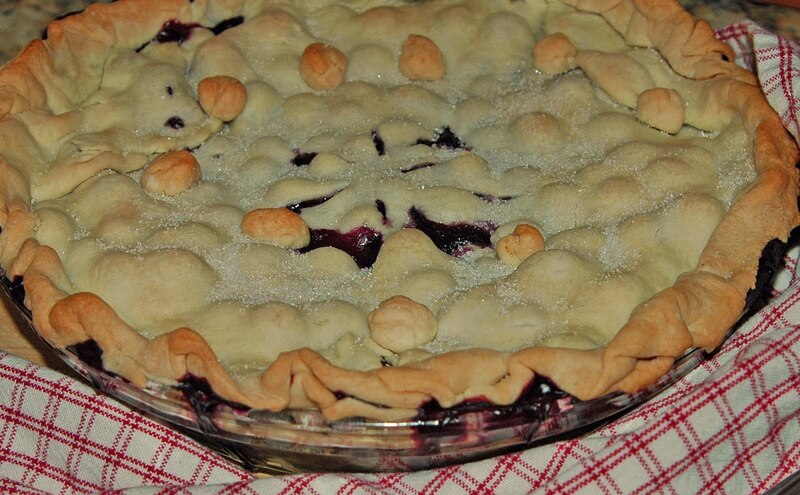 I've got a scrumptious Blueberry Pie recipe I want to share with you! Read a similar story by Rhonda of BlueCreekHome. Have a great day! See you Friday! Welcome to Farmgirl Friday blog hop # 16 ! Well, we did it farmgirls! Last weeks entries climbed from 39 the previous week to 47. There were so many great entries it was hard to choose who to feature this week. 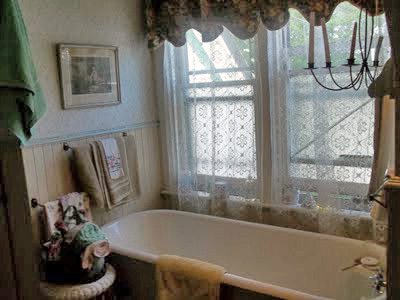 Faye at The Blessed Hearth has the most romantic cottage farmgirl bathroom! How do I know? She entered it in last weeks hop asking if she should remodel it. NO FAYE! Just, let it be! I'm on my way over for a nice long soak! Alana Jo of Bull Rock Barn and Home got my mouth waterin' with her entry. She's a new blogger exploring the world of homesteading. By the looks of her Wild Blackberry Jam I'd say she's on her way! Go see her and give her some blog love! 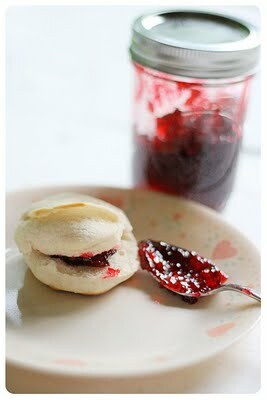 What's better than homemade jam and biscuit's? It's time to link up for your weekly dose of farmgirl soul-food! Things are really heating up at Dandelion House Garden! Nearly everything is blooming! The Garden is different every year. What I imagine it will look like and how things really turn out usually falls somewhere between the Garden I envisioned in my garden daydreams and the one that actually comes to be... This year, however, I have been completely enchanted as every flower comes into bloom. I've shared many individual blossoms with you in past posts but dear reader Rhonda of Christmas Notebook Blog left me a comment last week that inspired me to try to capture more wide open shots of my gardens for you! * Be sure to visit Rhonda, she has some beautiful bloomers over at her place! 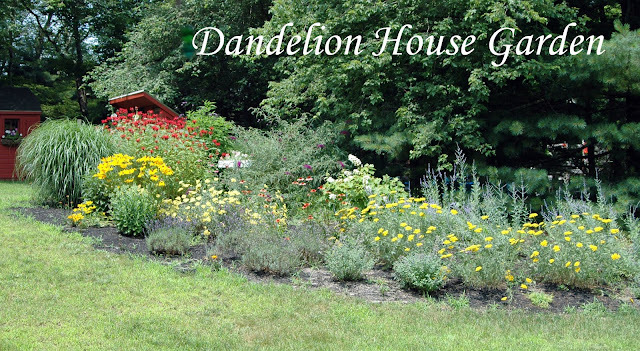 Rhonda said: Thanks for posting the larger picture of the entire bed with the monarda, etc. So often, garden blogs post pics of individual blossoms (which are beautiful! ), but I so enjoy seeing the whole picture. It gives me more inspiration that single flower shots do. Thanks for the positive feedback Rhonda! It has me looking at my Gardens with wider ( new ) eyes! 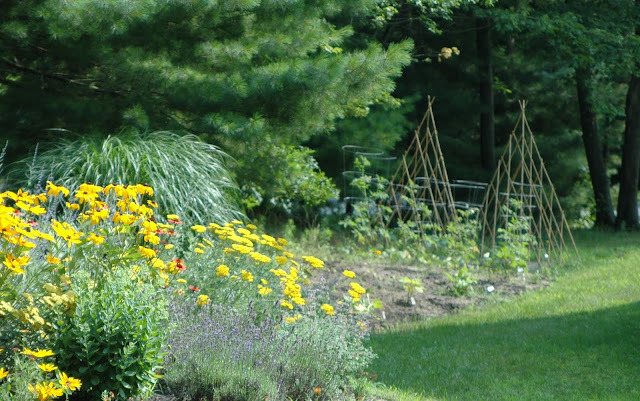 Today I'm sharing Garden Vistas! In this garden I've planted, Bee Balm, ( Jacobs' Climb ) which grows up to 5' tall and is mildew resistant. It is definitely the jewel of this border and one of my favorite blooms. It attracts hummingbirds and butterflies too. Would you believe a man at the nursery where I purchased it actually said, " I never plant anything red in my garden" .In my excitement over the red jewel I was tempted to say, " Well, you don't know what you're missing "! Yarrow, Russian Sage, Lavender, " Helecote and Munstead " Catmint, Black-Eyed Susan, (Goldstrom and Prairie Sun ) Goldstrom does not self seed but Prairie Sun does.Ornamental Grass ( Miscanthus " Morning Light " ), Oak Leaf Hydrangea, Autumn Sedum Joy, Butterfly Bush, Coneflower " Ruby Star and Sundown", Clover Root, Gay Feather, Verbena, Shasta Daisy, and Rhubarb fill the rest of the border with a riot of color and texture. 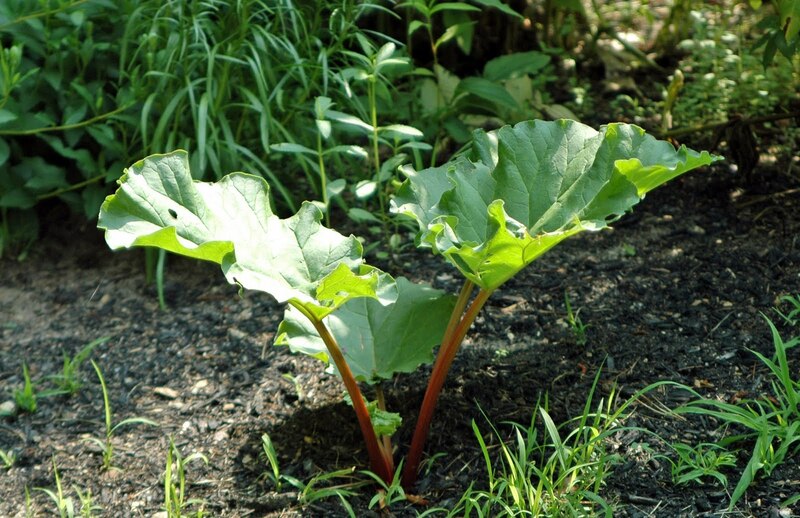 I had to sneak in some Rhubarb into my garden and this post! I won't be able to harvest it this year but it is plentiful in the produce section at the supermarket and hopefully at our local farmers market too. 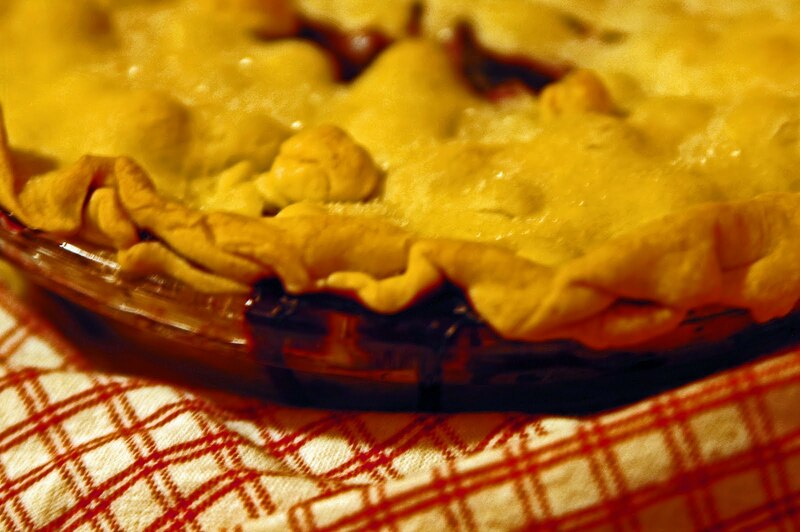 I'll share a recipe for my homemade Strawberry Rhubarb Pie soon! I call this my Summer Garden because it's located in the largest sunny patch of the yard. Many of the plants are bird and butterfly favorites! 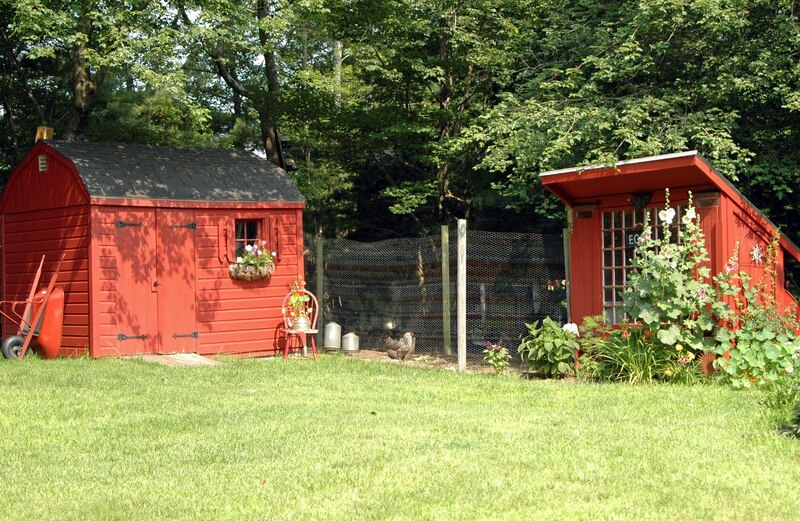 Our shed and the Little Red Hen House. Pretty girl Chestnut had to be in the photo too! This Garden is nestled below a tall divider of natural woods. belongs to the Sunflower family. It blooms late summer to early fall and grows 6-8 feet tall. It's not perfect. But it's mine! I've got weeds, and gaps that need more color, height and texture. It's my place to play, experiment and enjoy. At it's widest point it is 20 feet and gradually narrows to about 8 feet at the opposite end. It is roughly 80 feet long. Here you can see how I have tucked in a small place for veggies at the tip of the planting area. At the moment, the jury's out on my veggie garden. It was a cool, wet spring and the veggies seem to be growing in slow motion this year. * One of the most basic rules is to repeat- repeat- repeat- color, texture and pattern in your garden. This does work, but don't be afraid to plant more than one color in the same flower family. This will make your border look " less planned " and you will get to enjoy more of your favorites this way. Add taller plants to your border. They add drama even after the blossoms fade. Some rules are made to be broken, especially in the Garden. I hope this gardening season has been good to you and you are finding peace in your gardening days. I'm linking up to Homestead Barn Hop # 19, ,Missgreen "thumb" jean Bloomin' Tuesday and Tootsie's Fertilizer Friday!